I guess I could not have timed this video and post any better, as we are sitting today in a Chicago snow blizzard a week before Easter in the middle of April. As I write this, I am looking at my poor magnolia buds, wondering if the are D.O.A. This is pretty heartbreaking, as I am not sure how "cold-tolerant" Magnolia blooms are. But there ARE plenty of cold-tolerant blooms that you can plant now if you have the crazy weather swings like we do in the Midwest. 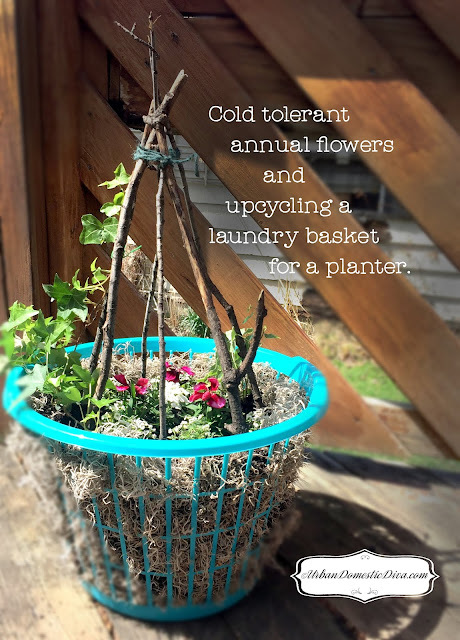 This week on Fridays with Flora, I talk about cold-tolerant annuals, and show you how you can turn a unique, inexpensive container like a laundry basket, into a cool planter for spring! Below is a list of some cold-tolerant annuals and other plant ideas for filler and structure. 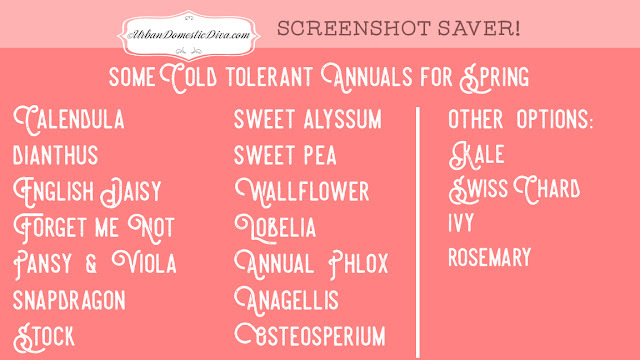 Take a screen grab or download to your phone before you go shopping for plants. Tender plants should not be planted until Mother's Day weekend in the Midwest. Here is a how-to for you! Please subscribe to my channel to keep up on the fun! We update it now every other Friday.